Do you want a multifunctional mat? Not only for offices and kitchens, but also for standing desk and commercial and so on. Please do not hesitate to choose our anti-fatigue mat. Sit down for a long time maybe have lumber vertebrae diseases, Long Standing will feeling fatigued and pain. So it is important to get blood circulation through the muscles massage on the mat.The massage points active blood flow and engage more muscles than simple standing mats are able to. The average thickness of the mat is 3/4"on the market, Ours is 7/8". This means that our mats are softer and more comfortable, perfect match for your standing desk. Comfort technology and fashion design. High-density Polyurethane Foam conforms to the shape of your feet and Bounce-back memory restores energy,It's a work of art. Water-resistant and non-slip traction ,grip bottom,No-curl, beveled edges that reduce tripping potential Stain resistant and easy to clean without any residue. 1. Multi-functional and Ergonomics Design: The massage spot design is added particularly to increase feet blood circulation and muscle engagement. In the office, work with the height-adjustable desk or in the kitchen, doing household chores, this mat will provide your feet with an amazingly cushioned layer of support, suspending your body weight and minimizing stress and fatigue. 2. Anti-Fatigue: Commercial grade thickness ( 7/8'' ) with the right elasticity, stability work as a great back and feet saver, anti-fatigue mat change your feet standing position, and relieves the pressure on your heels, back, legs and shoulders. It will instantly relief your pain, A anti-fatigue floor mat designed for comfort and durability will help you get through a long day on your feet. 3. Safe and Durable: High quality material, Standing desk mat is made of PU (polyurethane) foam. Non-toxic and phthalate free. Extra Thick for Comfort size (36''x 20''x 7/8'') then general mats in the market Mat is thicker and not break down or compress over time. 4. 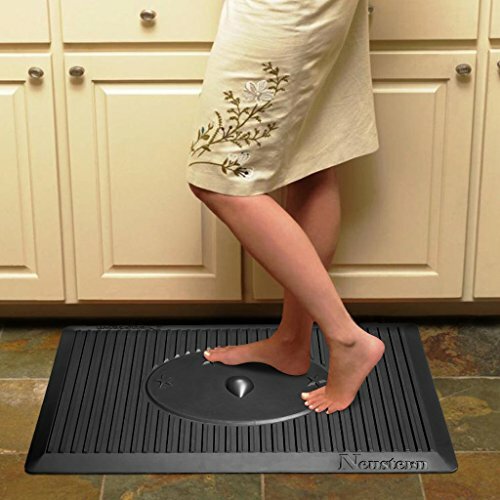 Non-slip and Easy to Clean : Non-slip top and waterproof keep your mat from slipping with the anti-skid design. Comfort mat enhances traction that also can protect your floor like oak. Easy to clean with a beveled edge A damp towel can wipe the dirt down and beveled edge makes it easier to clean. 5. 100% Satisfaction and Guarantee: You are protected by 5 years, no-questions asked, Too Easy Money Back Promise. If you have any questions about this product by Neustern, contact us by completing and submitting the form below. If you are looking for a specif part number, please include it with your message.